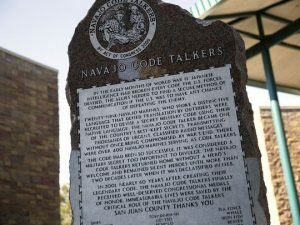 A large crowd gathered today outside the San Juan County administration building here to honor the Navajo Code Talkers during the dedication and unveiling of a new memorial. The speeches during the ceremony were delivered in English, Navajo and Jicarilla Apache. Navajo Code Talker John Kinsel Sr. of Lukachukai, Ariz., removed the veil from the large granite monument that includes inscriptions of the unbreakable Navajo code that was used to help win World War II. While Kinsel was the only living Navajo Code Talker who attended the ceremony, the families of about a dozen other Navajo Code Talkers attended the dedication. Anne Tso, whose late husband Samuel Tso was a Navajo Code Talker, said attending the ceremony was hard for her family. “I sit there and wonder what he would have said,” she said. Tso said she is appreciative of those who remember her husband and other Code Talkers. Helena George, the daughter of Navajo Code Talker William George, said her father would have been proud of the memorial. She said he always told her that he had gone to war to protect his people and his country. “Their warrior spirit must have been greatly aroused when they were told the country, our people and our land were under attack,” said Ron Kinsel, the son of John Kinsel.